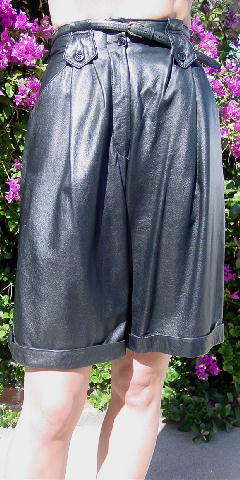 These extremely soft black leather walking shorts have a really nice black synthetic lining. There are belt loops and a black harness leather belt. They have a 7" long zipper fly and 2 front angled pockets. There is a one button tab in the back and 2 in the front. You can wear the belt through all the loops or angled through a tab. The 1 1/4" wide cuffs are velcroed to the side seams, front and back centers. The waist has a 2 black button closure. They're from a stylist's inventory, and were used in a photo shoot. 1st hole 31", last hole 27"